Here's my super clean and simple design for this week's My Favorite Things Wednesday Sketch Challenge. I dressed up a plain black card base with some mixed metallics and lots of sparkle. 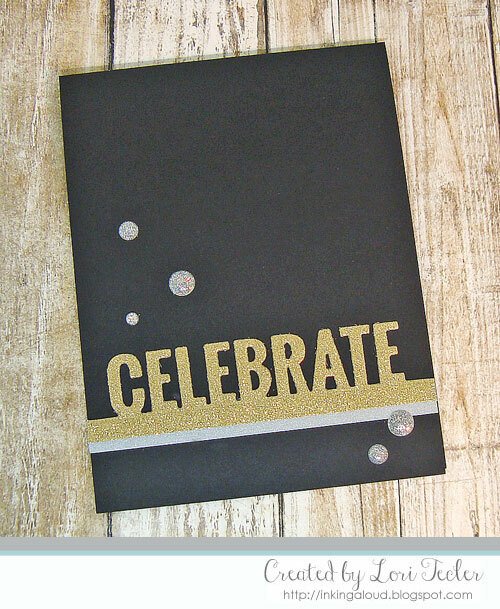 After cutting the word "celebrate" from gold glitter cardstock with a die from the Celebrate die set, I adhered the die cut word across the bottom of the cardfront. A narrow strip of silver cardstock was tucked underneath the bottom of the die cut strip. I accented the word with a bunch of silver glitter enamel dots in different sizes for even more sparkle and shine.